If you've had to travel with a combination of personal luggage + camera equipment before, then these transforming roller bags may be of interest. The Porter Cases are unique rolling cases that convert from a carry-on sized travel roller into a hand truck a.k.a dolly that you can stack up to 150 lbs of gear on. I can see how this could make life a little bit easier during travels. From what I can tell there are two main Porter Rolling Case models. 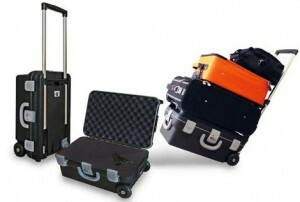 One is the The Porter PCX Lite Roller which is a semi-hard carry-on sized hard case (just the sides). 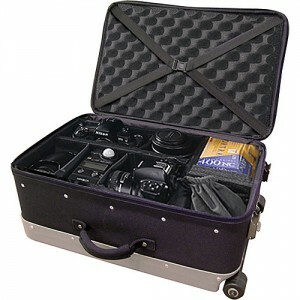 The other is a complete hard case (think Pelican) which are sold under several different models, due to the interior you choose. For example, there's a version for computers with an organizer lid, and another for Camera Equipment that has padded dividers and foam. The Porter Full Hard Cases are made from injection molding, have a built in combination lock which is handy when you're walking away from your bag at an event, and offer gasket seals around the lid to help prevent moisture and dust from creeping in. Maybe not the best looking cases, but i'm most interested in the functionality of the Hand Truck feature to cart around extra luggage after a trip to baggage claim. You will often find them cheaper via eBay (click here). Posted in Camera Bags, dslr video. Tags: Camera Hard Case Hand Truck Dolly, carry on video case, PCX Lite, Pelican, Porter Case, Porter Lite, roller gear bag, Video Hard Case on June 19, 2013 by Emm. I have owned two of these for almost 20 years and never set the lock. All of a sudden it is locked and I can't open it. Help! how do I order one???? I have the older Porter Case like jonyoshi and can say I still love it. Although I'm currently using a Pelican 1510 as my main camera case, I have my lights packed into the Porter Case so I bring it with me with almost every shoot. For me, I've had no problems and can whole heartedly recommend this case a "must" especially if you have more than 1 case for your shoots to bring. I've used these for years since they first came out many, many years ago and have mixed feelings about them. I've had several break. However, it looks like they have updated the design some, maybe its better now. But, they are heavy and the rolling part of it doesn't work as well as you'd think it does. I've taken these literally all over the world and don't anymore. Just my two cents.. I have the older hard case shown in the second video and I love it. I carry my 17" laptop and a bunch of paperwork in it and it does get pretty heavy, but I still throw it in the overhead bin. I regularly haul close to 150lbs on it, 3 suitcases at the max of 50lbs each. You have to be careful about pulling back on the handle as it will bend, pull back on the top piece of luggage instead. @ron - The popular Pelican 1510 Carry On rolling hard case specs at 13.6 lbs and I see this Porter specs at 11-12 lbs (depending on interior padding). Not too far from the other hard case. Hopefully the added feature of a hand truck makes it worth it. the biggest problem is the empty weight. Empty it's close to the maximum carry-on weight!